Kessler's Hall is an event venue for weddings, birthday celebrations, company happy hours, meetings, and holiday parties. Kessler's Hall seems hidden away, an oasis of beauty located within a bustling business district. With adequate parking north of the alley entrance, the capacity is up to 300 attendees. The natural limestone floors inside the hall cover a total interior square footage of 4000 square feet. The primary patio is a spacious 3000 square feet equipped with fountains, a fireplace, party lights, DJ or band set up, and a special area we call "The Chapel," as seen in pictures. The well-lit Entry, and Wall Street Patios offer your guests additional seating, water features, and smoking areas to enjoy. 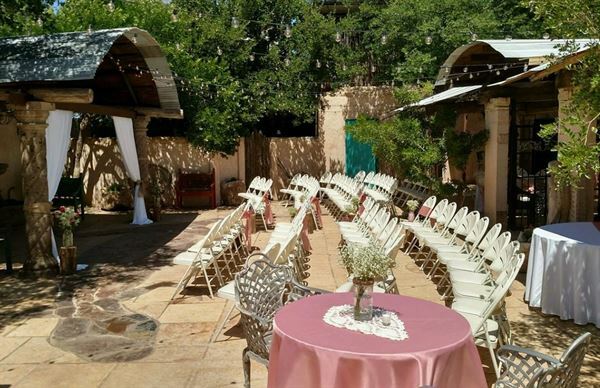 The primary patio is a spacious 3000 square feet equipped with fountains, a fireplace, party lights, DJ or band set up, and a special area we call "The Chapel," as seen in pictures.